I'm a card-carrrying member of the "I have a schedule and I'm stickin' to it!" club, BUT when it comes to scheduling my HOMESCHOOL day, I purposefully DO NOT have a schedule. With little ones to care for during school hours, our day has to be flexible...nearly fluid! Here's what it looks like. *Quick aside...with several children/grade levels to teach, I obviously can not teach a CORE subject to them all at the same time. With the help of Task Cards, the kids can skip ahead to their "simple subject", do an enrichment activity (board game, computer review game, puzzle, etc. ), or "play with the baby" time to one child WHILE I teach a core subject to another. The children each have an added incentive...if he/she can complete this solo activity quickly, he/she can have a few minutes to play until it is his/her turn to work on a CORE subject. What does your homeschool day look like? Do you have any helpful scheduling tips to share? When you do your core work, do you all of your Language Arts or some of it? For instance, do you do grammar, spelling, writing, reading all at once? Or just do one part of English, for instance grammar, and then move on to your next subject in your trio? And then later come back to a different aspect of English in your Trio? I hope that this makes sense. Also, do you put art in your "simple" subject area? Great idea, by the way. 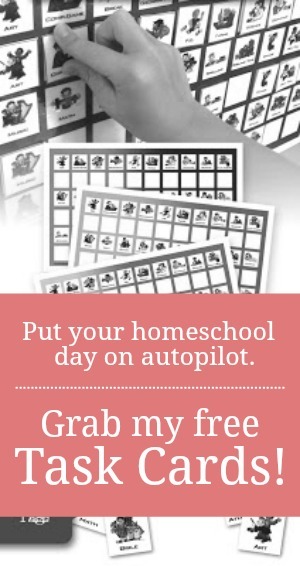 I like it and am thinking of implementing it in my homeschool. Great question! When I say "language", I mean JUST language...not reading, spelling, etc. Those other smaller language arts pieces are rotated in at other times. For my older ones, reading is considered a simple subject, but my younger kids who are LEARNING to read, it would be considered a CORE. Regarding art...it can be considered a simple subject because it is really activity oriented vs. workbook or living literature based. And depending upon the art program you use, your children could do art by themselves, but I prefer to do art with them...because I like art. Hope that answers your questions?!? If you are doing the other language arts pieces, like spelling, does that mean your TRIO might be done 3 or 4 times during the day? Thank you for your help and your video! I enjoyed it. Yep! We rotate the trio until all the subjects have been completed or until 5 o'clock...whichever comes first. I mentioned in the video that the major CORE subjects are Language and Math...but really anything that requires set up/teacher involvement (apart from just reading a book out loud) could be considered a CORE. So, that would include reading, spelling, art...depending upon what curriculum you use, how old your kids are, and how much involvement you choose to have in that subject. My son's reading is a CORE because he is still learning to read, so I have to sit with him and help him. My daughter's reading, however is a simple subject because she can do it on her own. This is fascinating. Our day is scheduled but different from this. I am only home educating three but need to have two of them doing "simple subjects" so I can spend teaching time with another. Three is a big number when you are talking three ENTIRELY different grade levels. You are doing the job of three traditional school teachers! Super woman! Thanks for posting, great video! We are homeschooling for the first time next year, and we are going to have another baby! Busy year! Im starting to get ideas, I like a schedule also!Im defintely interested in learning more about your routine. Thanks again, Sunnie. That does sound like a busy year! Remember to give yourself a lot of grace and lots of time to just be "momma" to the little one. So sweet of you to take the time to write that, Jennifer. Thank you! I'm so glad that a few of my thoughts have been helpful. That is really a great royal essay , I hope this will not be the last post you will write. Thank you for educating us.